This castle-like hotel is next door to the arts and culture district of Riverside Convention Center. Located west of Palm Springs, this resort is a half-mile from Premium and Desert Hill Outlet Malls. Convenient location to campus. Easy walk to several restaurants, movie theatres, shopping. Comfortable and clean. Renovation going on, some areas are dirty. Elevators had an unpleasant smell. Issues checking in. Where to find Riverside hotels near an airport? How can I find hotels in different Riverside neighborhoods? Where can I find hotels in Riverside that are near tourist attractions? If you are visiting the Southern California region and you're looking for accommodation in Riverside, Expedia offers a comprehensive list to select from. Our database shows no less than 25 places to base yourself within a 0.1-kilometre (0.06-mile) radius of Riverside's center. 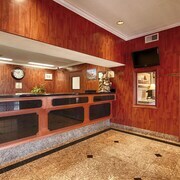 Riverside offers travelers a number of centrally located lodgings, such as the The Mission Inn Hotel & Spa and Hyatt Place Riverside Downtown. Moreno Valley, a popular Riverside hotel area with 8 places to stay is 15 kilometres (10 miles) away. 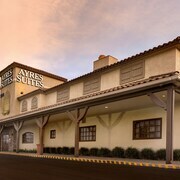 Amongst the more popular of the establishments in Moreno Valley are the Hampton Inn and Suites Moreno Valley and Ayres Hotel & Spa Moreno Valley. An alternative is Banning. 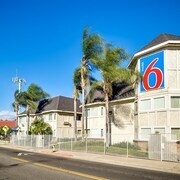 Banning is home to the Hampton Inn & Suites Banning-Beaumont and Holiday Inn Express Hotel & Suites Banning. Or, try Beaumont, where you'll find the Holiday Inn Express Hotel and Suites Beaumont and Rodeway Inn Beaumont. 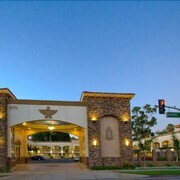 The Residence Inn by Marriott Corona Riverside and SpringHill Suites by Marriott Corona Riverside can be found in Corona, while Hampton Inn Norco-Corona-Eastvale and Regency Inn Norco are part of the Norco area. If you have a limited budget and are hoping to find deals on Riverside accommodations, there are also enough affordable places available in the area. The Econo Lodge Inn and Suites is 13 kilometres (8 miles) from the center of Riverside, while the Rodeway Inn Beaumont is 40 kilometres (24 miles) away. Additional affordable room options include the Comfort Inn Moreno Valley near March Air Reserve Base and the Santa Cruz Inn Riverside. The Lake Arrowhead Resort and Spa, Autograph Collection can be found 35 kilometres (21 miles) from the main part of Riverside. Alternatively, the Saddleback Inn is positioned 35 kilometres (21 miles) away. Two more hotel and apartment options in the area include the Embassy Suites Ontario Airport and the Holiday Inn Express and Suites Ontario Airport. After you have explored Riverside, why not travel a bit more of the region? The Southern California vicinity has many things to offer tourists. Check out Southern California's art galleries, open-air exhibits and street art and also admire the region's beaches. Common pastimes in this particular part of United States of America include snowboarding, skiing and rock climbing. 80 kilometres (51 miles) from Riverside is Los Angeles, where visitors can enjoy University of Southern California and Hollywood Walk of Fame. The The Ritz-Carlton, Los Angeles and JW Marriott Los Angeles L.A. LIVE are a few of the great apartment and hotel options in Los Angeles. Alternatively, you could consider staying at Adelanto, 65 kilometres (41 miles) to the north of Riverside, where you'll find the Americas Best Value Inn Adelanto Victorville and California Inn & Suites. While visiting Adelanto, a couple of sights worth adding to your itinerary are the Richardson Park and Adelanto Branch Library. Ontario International Airport is a logical airport for arriving in Riverside. It is 20 kilometres (13 miles) drive away. 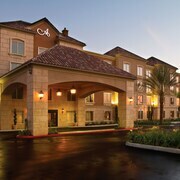 If you would like to stay nearby, try the Residence Inn Ontario Airport or DoubleTree by Hilton Ontario Airport. What are the most popular Riverside hotels? 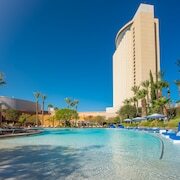 Are there hotels in other cities near Riverside? What other types of accommodations are available in Riverside? Explore Riverside with Expedia.ca’s Travel Guides to find the best flights, cars, holiday packages and more!